^ Wow! It would be awesome if that would be built someday. • Right-of-way limits have been established for SIU 12. In Arkansas, right-of-way has been acquired for the segment from just west of Highway 4 to the Mississippi River. The Department is currently investigating alternative acquisition methods to preserve the highway corridor from Highway 65 in McGehee to just west of Highway 4. MDOT ROW Division has not seen anything concerning this project at the present time. It seems like, in order to make an effective "sell", Arkansas and Mississippi would need to present a joint effort, if for no other reason than for both states to acquire ROW in order to preserve the SIU 12 corridor. AHTD, has the congressional delegation asked AHTD to coordinate its information-gathering with MDOT? Most all future construction is on hold at this time from everything I see. Most of the money appropriated is for Bridge Repair and road maintenance according to the Mississippi Legislature. I do not anticipate further construction on the Mississippi side until the MDOT funding woes are solved. And that may take years. As for federal funding, I do not know what the Congressional delegation in Mississippi is doing toward the bridge. But it is election time for the congressional delegation and I assume that Congressman Bennie Thompson (D-Miss) is working on that end along with the rest of the Mississippi delegation. You might also ask the Columbus and Greenville RR what their plans are in regard to the bridge. Just drove through where the new bridge is anticipated a few days ago. Holy crap. To imagine an interstate running through there is almost inconceivable. Arkansas City is in the middle of nowhere! But let's not forget one of Arkansas' highway commissioners, Robert S. Moore, Jr., is from there. I'm sure he wants to put it "on the map", so to speak. Indeed a rail component was considered at one time, but as a separate PARALLEL structure. That's right! TWO cable-stays side-by-side. Delta Council has always been a strong advocate of the entire intermodal transportation concept for the Delta and the State of Mississippi. We continue to support the view that Mississippi ports, commercial aviation, highways and railroads must be maintained and improved in order for our region to become nationally competitive. WHAT?? When did G & W buy the CAGY?? Grzrd, from the "Pipe dream" department. The highway (not railroad) version of that proposed I-69 bridge with those high pillars is the type I'd love to see them build on I-49 across the Arkansas River. That would be seen for miles as one reaches the northern hills of the River Valley traveling south. If only Norfolk Southern wouldn't have sold off and abandoned the line between Berry, AL and Columbus, MS that tied into the Columbus and Greenville Railroad. The east end of that line ties to the Norfolk Southern NA West End District in Parrish, AL and goes to Birmingham, AL and then Atlanta, GA via the NA East End District. 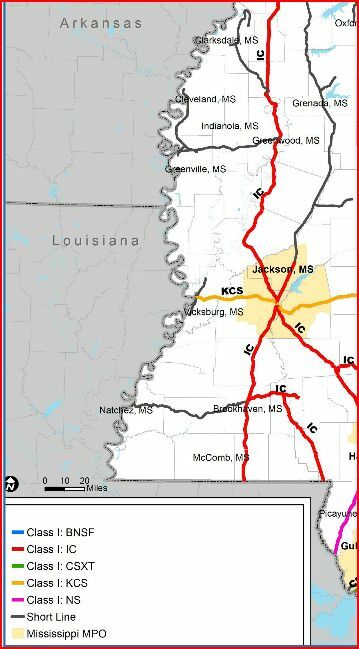 Then again, it may be redundant to the KCS Meridian Speedway line between Shreveport, LA and Meridian, MS.
we're likely to see I-49 completed before I-69. HOWEVER... keep an eye on the state congressional delegation - we have recently brought them up to speed on what it would take to see this corridor realized in Arkansas. The slide seems to support the case that, with design complete and ROW acquisition underway, the project is close to being shovel-ready if a financing solution can be found. Note: Right-of-Way Acquisition is ACTIVELY underway. Our appraisal team is in the area this week! AHTD, are they acquiring ROW all of the way to US 65? "If you look north to south," said Randy Ort, public information officer for the Arkansas Department of Transportation, referring to the I-69 corridor, "you can't have a highway without crossing the Mississippi River." Leaders in Arkansas' Desha County and Mississippi's Bolivar County have been talking about building a bridge to connect to two communities since the mid-1980s. In the mid-1990s, what is being the called the Great River Bridge was suggested as the Mississippi River crossing for I-69. In 2004, the Federal Highway Administration issued a Record of Decision approving the location of the Great River Bridge as the I-69 Mississippi River crossing. 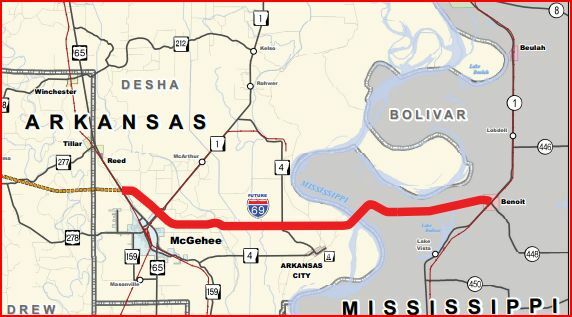 The current plan calls for a four-lane bridge between McGhee, Arkansas and Benoit, Mississippi. It is estimated to cost $1.3 billion. 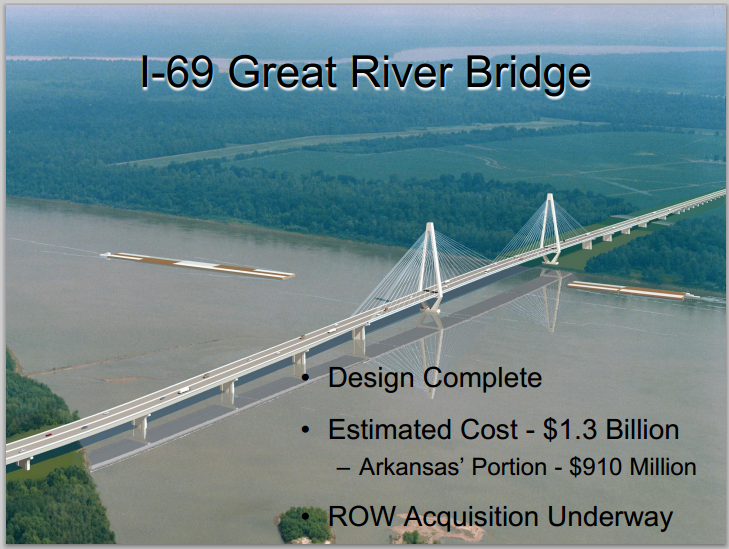 "Funding is the greatest obstacle," Ort said referring to not only the bridge, but the entire I-69 project in Arkansas. 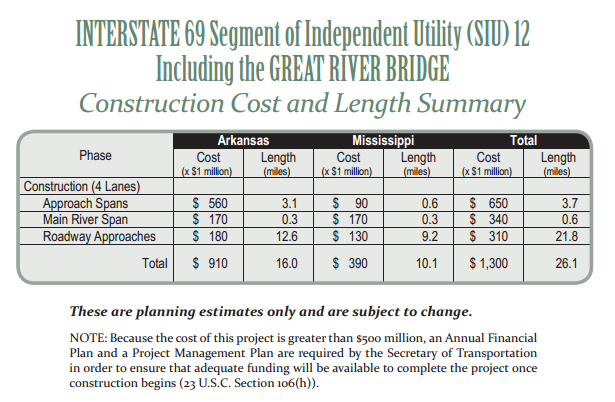 I suppose it's noteworthy that, in regard to I-69, AHTD is placing a lot of relative emphasis on the Mississippi River crossing. Maybe they have received a signal from Congress that the Mississippi River crossing is the best I-69 candidate to receive a significant infusion of federal money at this point in time. The Mississippi River crossing is truly a segment of independent utility, as opposed to many of the porkier pieces. Indeed. It can also carry US 278, which will eliminate its out-of-the-way routing between McGehee and Cleveland. 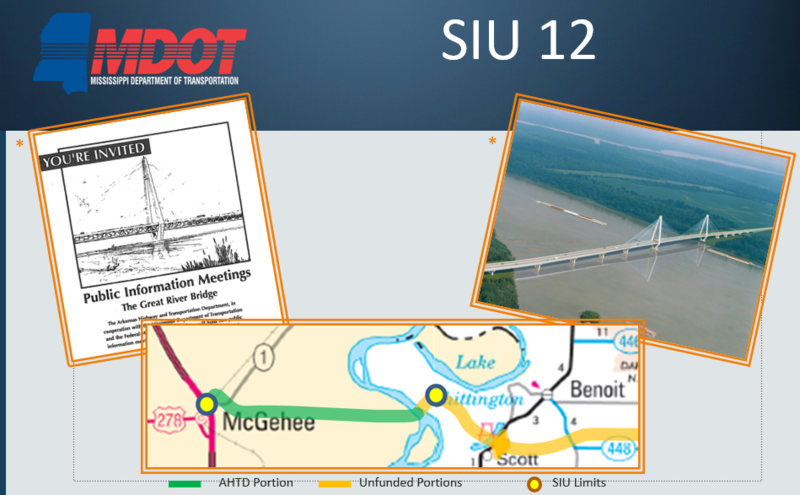 Unless they've moved the SIU boundary, SIU 12 really starts at MS 1, since otherwise the bridge wouldn't actually connect to a highway on the Mississippi side of the river and thus lack independent utility. As far as I can tell, at the time the Record of Decision ("ROD") for SIU 12 was issued, it was intended that the later SIU 11 Final Environmental Impact Statement ("FEIS") would identify the Preferred Alternative for the Great River Bridge to Benoit/ SR 1 segment of SIU 12, but it appears that, at some point during that process, MDOT moved the SIU 12/ SIU 11 boundary to the eastern end of the bridge itself. The common River Crossing Alternative includes the Mississippi River bridge structure. It begins approximately 1.0 mile (1.6 km) east of Route 4, at the common connection point of the four McGehee segment alternatives. This alternative will be on embankment for about three-quarters of a mile and a right-of-way width of 350 feet (106.7 m) will be used. From this point to about 4,200 feet (1280.2 m) east of the Mississippi East Levee, the roadway approaches and the Mississippi River Crossing will be on structure. This will allow the right-of-way width to be reduced to 200 feet (70 m). The alternative will continue on from this point at grade with an assumed right-of-way width of 350 feet (106.7 m), until it reaches the Benoit segment somewhere near Beaver Dam Road. 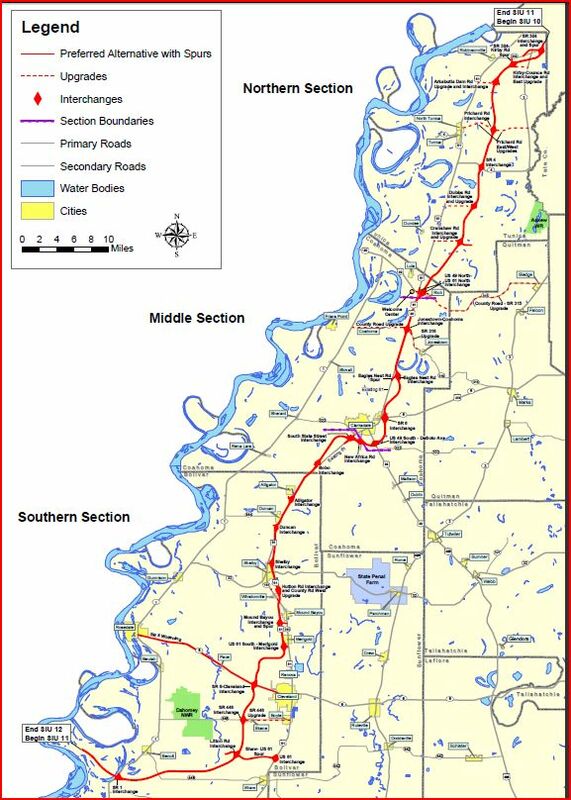 Though the limits of this SIU extend to a connection with Route 1 in Mississippi, this Final EIS will not select a preferred alignment within the Benoit Segment. The EIS for SIU No. 11 will assess the full range of the Reasonable Alternatives in the Benoit Segment and will select the preferred alignment within this segment subsequent to this Final EIS .... The EIS for SIU No. 11 will define and select the preferred alignment for the Benoit Segment of this SIU. The Preferred Alternative begins at the SIU 12 terminus and proceeds southeast across Lake Bolivar. It crosses SR 1 north of Scott at Lake Vista and then turns east before crossing SR 448. It seems like, somewhere along the SIU 11 FEIS way, the anticipated Great River Bridge to Benoit/ SR 1 segment of SIU 12 instead became part of SIU 11 and Beaver Dam Road became the unlikely eastern (northern in overall I-69 terms?) terminus of SIU 12 (with doubtful independent utility). It would make sense for the portion between US 65 and US 61 be an SIU. Or, move the boundary east so that SIU 11 encompasses that. This way, US 278 can be rerouted across the bridge and it would eliminate the long detour the route currently has to take. True but it would be one step closer to I-69 being completed (even though it may not ever be completed in our lifetimes). I don't get it. US 61 already exsists and is four laned through this area. There is already a bridge that US 278 is routed upon. Waste of taxpayer money. While I agree about 61, I disagree about the need for the bridge IF it is combined with a new rail crossing. A new rail crossing would need to be augmented with new rail up to the crossing on both ends. On the east end, the nearest main railroad is the CN line that runs through Greenwood. There is also the Columbus and Greenville railroad, but it is essentially abandoned for most of its length. On the west end, there is a UP line that isn't too far away. Neither an I-69 interstate bridge nor a parallel railroad bridge is included in the 2040 Plan, but it seems that a rail connection on the Mississippi side is now more feasible. The thing I struggle with for a rail bridge across the Mississippi is that without investment from Class I railroads (the closest of which is UP on the Arkansas side, and CN on the Mississippi side in Greenwood), I don't see it happening. Of course, the I-69 bridge is a pipe dream as it stands. Also, I don't know how much it would benefit cross-country intermodal trains. IF I-69 is ever built in this area and if an intermodal terminal was built near Greenville or Benoit, then it may make both the rail bridge and restoration/upgrade of the former CAGY line between Greenwood and West Point more feasible. It would also require new track between McGehee and the new bridge. A lot would have to go right before the rail bridge across the MS River is feasible, IMO.